BOTW seem to have gone the Yahoo! route of bundling Ireland with the UK, but for me the problem is adding an Irish directory on UK ccTLD. Let’s face it – the listings is unlikely to get you much traffic, so SEO benefit is important. Getting a link from UK ccTLD is not likely to provide quite as much support to Irish rankings as the same link from the parent botw.org gTLD. I realise there are other factors at play, but from an SEO perspective that’s what would strike me. Is Canada part of the USA? That always pisses off Canadians. To me that reads like a parent-child relationship, as in Ireland is a child category under the “BOTW UK Directory”. 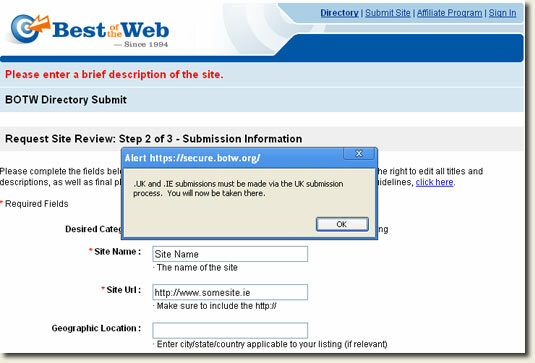 Not the best way to handle Irish websites or webmasters I think. So will I be renewing or buying listings in the new BOTW UK Directory? Well given that the listings has even less value (IMO) to humans – who’s going to use a “UK Directory” to find information about Ireland? – and the fact that links may have less value now – links from UK ccTLD probably have slightly less value everything else held constant – I doubt I will. It’s probably been like this for yonks (shows how often I visit their site…), but this is still an epic fail for BOTW.